To find the heart of a city, look no further than its market. And to find the soul of a market, just look to its people. At Bolhão Market in Porto, Portugal, most of those people are tough-skinned, sharp-tongued grandmothers hiding hearts of gold under multi-colored sweaters. They peel produce and wield fish knives with precision, exchanging gossip and melancholy verses of fado. They preside over a microcosm of northern Portugal. Produce from the lush Douro Valley meets seafood from the cold Atlantic waters, alongside country breads hand-baked in its small rural villages. Great slabs of bacalhau, cured cod, are stacked next to fresh fish; smoky chouriço and game meat-stuffed alheira sausages hang from walls; honeycomb tripe soaks in a lemon-water bath for Porto’s signature tripas à moda do Porto stew. Today, this microcosm operates in the basement of a shopping mall, a temporary site. The original open-air market, housed in a crumbling building built in 1914, is closed for renovations. For decades before, Bolhão served as Porto’s community hub—a gathering place for people to sell their goods and share stories, and a bastion of tradition and history. But with the advent of supermarkets and mega-malls, mass consumption pushed out local products, and the convenience of one-stop shopping overshadowed the specialized merchants of traditional markets such as Bolhão. Forgotten and neglected, Bolhão fell into disrepair. Newspaper headlines touted promises of restoration and renovation for more than three decades, but they never came to fruition, leaving the space marred with ugly scaffolding, tattered tarps, and scores of empty stands. The number of vendors dropped to less than 100 from 400, in part because they were prohibited from passing licenses down to their children. Meanwhile, other markets were transformed into modern, highly curated gourmet renditions, or repurposed into other public spaces. After decades of uncertainty, Bolhão was finally closed for renovations last year. The remaining vendors were moved to their temporary location until the expected reopening in 2020. Opaz and Nolasco, an American living in Porto and a Portuguese living in America, respectively, had originally intended to write a simple gastronomic guide and cookbook of Porto, a collection of “grandmother recipes” pulled from the memories of the market matriarchs. But the project took on a life of its own. Forget how you make the bread, Nolasco said; the vendors were more interested in sharing the stories behind it. It’s a book about food, yes, but also its inextricable ties with the people, places, and traditions behind it. Interspersed with history lessons, food and restaurant recommendations, and just a few recipes, these stories of Bolhão’s people are stitched into a living, breathing, patchwork portrait of the market, and, by extension, one of Porto and northern Portugal as a whole. Bolhão was partially saved from the fate of other traditional markets by its architectural heritage. The local government designated the neoclassical, Beaux-Arts-style building a “Monument of Public Interest,” granting the space a special protection status and saving it from complete demolition. But equally in need of preservation, Opaz and Nolasco argue, is the wealth of human heritage within its walls. “There was something to protect the stone and steel of this building, but nothing to protect the flesh and blood, the stories of these people,” Nolasco said. The market has seen three generations of vendors. Many of the current ones grew up there, playing jump rope and hopscotch in the storage areas while their mothers tended to their wares, looked after by a whole community. And when they turned 12, 13, or 14, they started working at their mothers’ sides, propped up on boxes to reach the counters. Now, they run their own stands. The traditions they uphold reach still further back. Opaz and Nolasco describe a bread vendor, for instance, who hails from the town of Avintes, “a place where baking bread is ingrained in the people’s DNA.” Helena Rosa Pereira and her siblings freshly bake her family recipe for broa de Avintes, a dark, bittersweet bread made with rye and cornmeal, to sell at Bolhão every morning. It’s a ritual handed down from her mother and generations of legendary “padeiras de Avintes,” or female bakers of Avintes, who toiled throughout Porto long before the market opened, then balanced 100-pound baskets of the loaves atop their heads as they trekked across the Douro River and to the city. Their strength is reflected in the story of the bread itself, too. Northern Portugal’s cornmeal-based broas arose from its people’s resilience—poor soils and harsh winters made wheat impossible to grow, so they adapted with corn. Meanwhile, at stands laden with Portugal’s famed seafood, Bolhão’s fish vendors carry on the legacy of the country’s vareiras—fierce fishwives who found work in the city and fended for themselves and their families while their husbands were at sea. They clean and cut their glistening catches with expert precision, and woo customers with traditional “pregão,” lilting sales pitches that carry across the market. They, and the other women of Bolhão—who make up the majority of vendors—epitomize the resilience of the historical matriarchs of Portugal, Opaz and Nolasco write. Well into their 60s, 70s, and 80s, many of them illiterate, they continue to run their own businesses, persisting through change and loss while holding firm to their roots. The majority will return to Bolhão when it reopens, Nolasco said. It’s the same resilience that extends to the whole of Portugal, a country tested time and time again by wars, decades under a dictatorship, mass emigration, and a culture of seafaring and the losses that accompany it. The vendors at Bolhão have something we’ve lost, the authors say: a deep interconnectedness with their food, a true understanding of what they’re selling and eating. 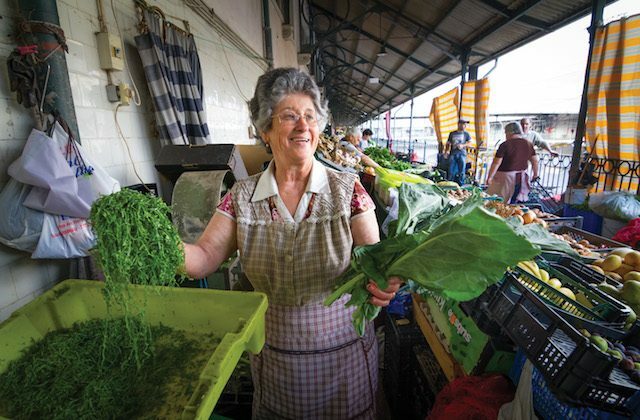 The same woman grows, picks, and hand-shreds kale and collard greens sold in long strips for caldo verde, a traditional Portuguese soup. Another has raised live chickens on her land for 20 years, and slaughters them on the spot for her customers. Each specialized in their trade, they’re treasure troves of knowledge and old wisdom. Pack fish up with a large kale leaf to keep it cool, and coat it with cornmeal instead of flour for frying to get a smoother texture, the fishwives counsel. They also have a wealth of life experience and colorful stories. As she holds a freshly slaughtered chicken in her hand, while wearing layers of sweaters and a checkered apron, Lucinda Leite tells Opaz and Nolasco of her younger days in the market’s prime, when she would doll herself up for the Air Force pilots who would come to flirt with her. Maria Madalena Machado, the eldest bread vendor, tells of how she would regularly dispense counsel to troubled mothers and wives who came for her rustic loaves and fluffy rolls. “We have to uplift people,” she says. For Nolasco, this exchange of knowledge and humanity—alongside the food—is central to the enduring value of Bolhão and traditional markets like it. 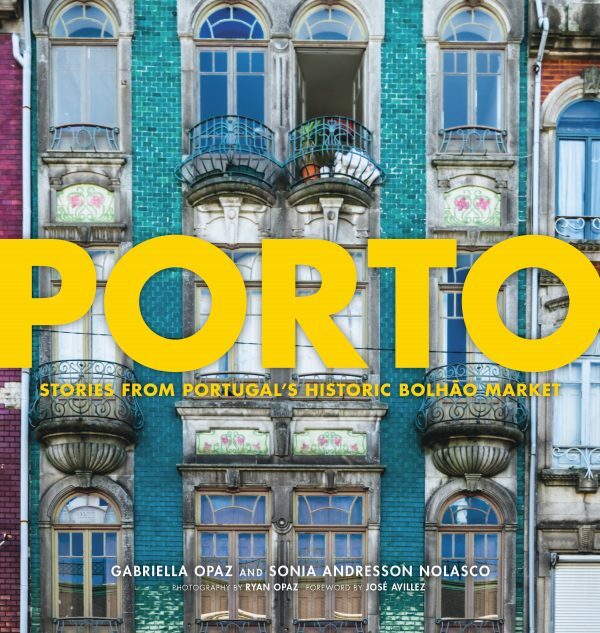 “Porto: Stories and Recipes From Portugal’s Historic Bolhao Market” by Gabriella Opaz and Sonia Andresson Nolasco ($29.95).